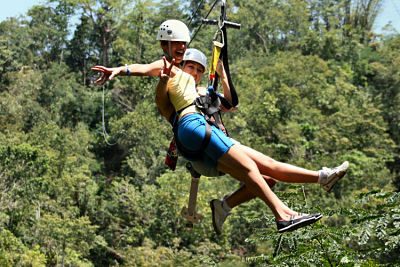 Zip Line Canopy tour from Falmouth Cruise Pier is the most enjoyable experience you cannot afford to miss, enjoy the spectacular views of rural Jamaica on the longest Zip Line adventure in Jamaica, choose from one of our 5 Zip Lines, varying in length from 250' to the amazing 1,600' feet. Zip Line Canopy tour from Falmouth takes you on an experience of a lifetime, feel the sensation of flying with the birds as you pass over the tree canopy. Marvel at magnificent views of the Jamaica hills, rivers, and farmlands below, while obtaining speed of up to 40 mph, Our Zip Line Canopy tour includes an exciting off-road ride in our 6-wheel drive military troop transport vehicles. After this overwhelming Zip Line Canopy Experience you are welcome at our welcome area that features a snack bar, rest room facilities, and tables and chairs along the River, ideal for relaxation while you anticipate your ride back to your place of stay. Round trip transfer between Falmouth cruise ship pier and Zip Line Tour. Zip Line Canopy & guide entrance fee.